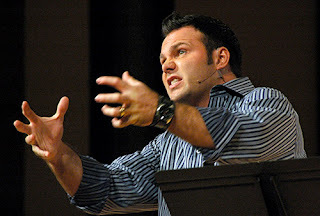 I've always had my beef with Mark Driscoll. I sorta think of him as the Rush Limbaugh of the Church... a man whose arrogance allows him to say offensive, flippant, and outlandish things and whose mouth runs faster than his mind. He seems to operate on the assumption that if you say something loud enough, fast enough, and with enough "authority" then it must be true. And just when you think that he's gone so far that nobody will take him seriously, you remember that he's one of the most downloaded and influential voices in the Church. I had the privilege of actually hearing him speak once at a conference here in San Diego and I remember that his disdain for "liberals" (which apparently includes anyone less conservative than Wayne Grudem, which is almost everyone), his judgement against pretty much all people who disagree with him (especially bloggers like me), and his flippant remarks about people who show any real emotion really made it hard to hear anything good he may have had to say (although I did extract a few nuggets). His whole talk, other than a few basic points that were worth some thought, seemed to serve as little more than an argument for his own power and authority. Needless to say, I skipped his next seminar. If you read my last post on "Professionalism in the Priesthood," I think Mark Discoll is an example of the lack of professionalism I'm warning against. But he doesn't try to downplay his authority. Not at all. His lack of care for the words he speaks comes from an overdeveloped sense of authority. As I read one ex-member of Mars Hill (Mark's Church, not to be confused with Rob Bell's Church in Grand Rapids) report, "If Mark had ecclesiastical power to burn [someone] at the stake I believe he would..." A harsh accusation! But dangerously consistent with the character I've observed from Mark, who, at the conference where I heard him, spoke casually of "shooting" the heretics in the church, "wolves in sheep's clothing" (again, people who disagree with his narrow theology). Next time I'll wear a bullet proof vest. Now, this is not to cast judgement (although, I am aware that that's sorta what I'm doing). This is not about Mark Driscoll. This is about Pastoral leadership everywhere. There's a reason that someone so pompous and so authoritative is among the most influential people in evangelicalism.... and it's cause for real concern. I feel that as the culture is changing and ethics are developing, evangelicalism is struggling to stay relevant. In a world where gender roles are little more than a relic from a dark spot in our history, where social justice is being taken seriously over against moralism and orthodoxy, and in a culture where homosexuality has become more and more accepted and gay rights has been deemed a justice issue (and rightly so), The kind of evangelicalism which condemns homosexuality, keeps women limited to specific roles, and values orthodoxy and evangelism over social justice is being cornered and their rhetoric is getting stronger, louder, more offensive, and more aggressive. Like a dog, friendly in it's comfort zone but deadly when it's threatened, the conservative evangelical world is barking and even biting. That's making Mark Driscoll and his style of "ministry" very popular. The issue here is spiritual abuse (for an example of this, pertaining directly to Mark Driscoll, read this). When Pastoral leadership feels cornered, it can be dangerous for any alternative voices. Obviously they believe in their cause and they make that clear enough. If they believe in it strongly enough and if they hold on to it tightly enough, they may come to see justification for leveraging their power even in the form of exploitation and slander. Such power eventually becomes toxic. Such abuse it completely antithetical to the gospel. Indeed, the exploitation of power is antithetical to the mission of Christ no matter how noble or "truthful" the cause may seem. As Pastors, it's just as important for us to recognize and take seriously the power we have as it is for us to hold it loosely. Afterall, our task is love which challenges all forms of coercion. I'm afraid that if Mark Driscoll's popularity is any sign of the times, pastors are finding justification, more and more, to wield their power--even at the expense of others. The justice of God, or at least a false notion of justice, is forcing love into the back seat as the values of evangelicalism are being more and more marginalized in culture. In times like these it is all the more vital that the church loosen its grip and follow the way of Christ, to walk to the cross, refusing anything but love, trusting that resurrection is just around the corner. Pride comes from a lack of trust. Coercive power comes from placing the cause before the cross. The church is in dire need of humility and the solution starts with us. May we abandon the project of relevance and self-preservation and take up the cross. Let us abandon our witch-hunt, looking for heretics around every corner, and simply love even the ones with whom we disagree. May we live a life of love, forsaking our power, forsaking our insecurities. May we trust the God who hung on the cross of irrelevance and was exalted to the highest place.